Akiko Yamanaka (山中 あき子? Yamanaka Akiko, born November 6, 1945) is a Special Ambassador for Peacebuilding of Japan. She was a Japanese politician of the Liberal Democratic Party (LDP), a member of the House of Representatives in the Diet (national legislature). 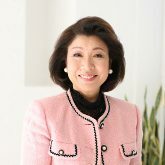 A native of Otaru, Hokkaido and graduate of Tsuda College, she was elected to the House of Representatives for the first time in 1996 as a member of the New Frontier Party. She later joined the LDP.